A white stucco house of unassuming character, my parents’ house looks a lot like many others in Southeast Arizona. That the house is sandwiched between the beautiful Patagonia-Sonoita Creek and the woodlands of The Nature Conservancy, making for an unusually green backdrop in an otherwise barren landscape does make it special. And that it is located off Scenic Highway 82 in the idyllic hamlet called Patagonia, surrounded on all sides by mountains, only adds to its charm. 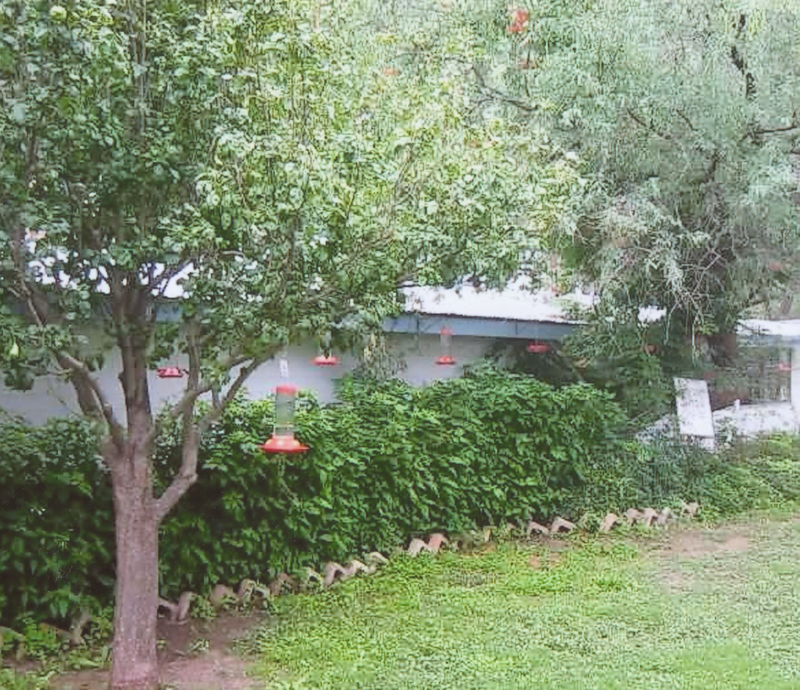 Although these characteristics make it special, it is the yard that sets it apart from all other houses – the yard that became known as “Paton’s Birder Haven,” a “mecca” for birdwatchers and naturalists from all over the world. So began a 1992 article called “Hummingbird Hosts,” written by wildlife photographer, Artie Morris, for Bird Watcher’s Digest. When it arrived on my doorstep in Connecticut, I read it with pride, but was taken aback that my parents had been written up in a national publication. Feeding birds had been a lifelong passion for them, but why were they getting national attention for feeding birds? The attraction that day for Mr. Morris and for thousands who followed behind was the enigmatic Violet-crowned Hummingbird. A remarkable story started to unfold. Over the next decades, continuous feeding presented exciting bird sightings at the edge of the Patagonia-Sonoita Creek Preserve, among them the rare Violet-crowned Hummingbird and, on occasion, the Plain-capped Starthroat. Adjacent to The Nature Conservancy preserve, birders would line the fence along the Paton property with cameras and spotting scopes trying to get a glimpse of these jewels in flight. At this point, my parents decided to open their gate and welcome the public. So a canopy tent was erected and benches and birding guides were set out. They set up a chalkboard so daily sightings could be posted and installed a tin can on the gate called “the sugar fund,” for donations to help defray the cost. A guestbook followed and soon filled with the names of the thousands who visited each year, many numerous times. Where once there was a huge vegetable garden, they built a large water feature for the birds. Word spread quickly throughout the birding community and visitors started arriving from around the world. But it wasn’t just the birds and birders who flocked to Paton’s, the media began arriving curious to hear the story of this generous and gracious couple who opened their yard to thousands asking nothing in return. Attracting media attention for decades, Paton’s Birder Haven has been the subject of numerous magazine articles including those in National Geographic, Smithsonian, Bird Watcher’s Digest, National Wildlife and more. In the first of two PBS specials filmed at the property, my parents tell the story of how it all began from the planting of flowers and bushes, to the visit from Artie Morris and the hundreds who lined their fence and finally their decision to open their gate and welcome in the world. Life around the Paton house was never quite the same.